To Cite: Nouhi M, Azami S, Jahangiri R, Rostami M A, Hosseinzadeh Roknabady Y. 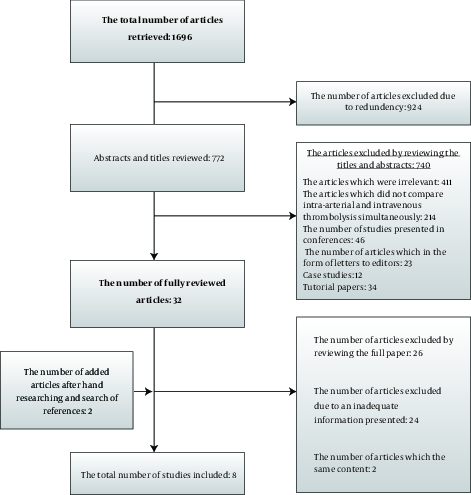 The Clinical Effectiveness of Intra-Arterial versus Intravenous Thrombolysis on the Treatment of Patients with Acute Stroke: A Systematic Review and Meta-Analysis in Clinical Evidence, Health Tech Asmnt Act. 2017 ; 1(1):e60091. doi: 10.5812/htaa.60091. Context: Application of anti-clot drugs such as recombinant tissue plasminogen activator (rt-PA) to treat patients with strokes is considered as a standard treatment employed through two techniques: intra-arterial and intravenous thrombolysis. The current study aimed at comparing the clinical effectiveness of these two injection techniques. Methods: The current systematic review searched Google Scholar, Web of Science, Embase, Cochrane, and PubMed databases. The time span of the searching was from 1990 to 2017. The quality of the selected articles was evaluated. The fixed effects and random effects models were used in the meta-analysis. The results were subject to sensitivity analysis in the specified interval. CMA.2 (Comprehensive Meta-Analysis 2) software was utilized to conduct the meta-analysis; α value was considered 5%. Results: Eight studies met the inclusion/exclusion criteria. Intra-arterial thrombolysis was more effective to reduce mortality rate (odds ratio (OR) = 0.40; 95% confidence interval (CI): 0.17 - 0.92; P = 0.032). Intra-arterial thrombolysis was more effective to improve symptoms compared with intravenous thrombolysis (OR = 3.28; CI: 1.91 - 5.65; P < 0.001). Neurological dementia was bigger in the intra-arterial thrombolysis group compared with that of intravenous thrombolysis group. The mean of recanalization was 49% and 50.8% in the intra-arterial and intravenous thrombolysis groups, respectively; the difference between the results was not statistically significant (P > 0.05). Intracranial hemorrhage value was 11.33 % and 9.52 % in the intra-arterial and intravenous thrombolysis groups, respectively, which was not statistically significant (P > 0.05). Conclusions: In spite of the low number of robust evidence, it can be concluded that intra-arterial thrombolysis can be more effective than intravenous thrombolysis. Stroke causes damage to neurons when blood supply to a specific part of brain tissue is interrupted. This can occur by a blocked artery or the bursting of a blood vessel (1-3). Stroke is the most prevalent neurologic disease and also the most prevalent cause of mortality and morbidity in mental patients. Stroke holds first among cardiovascular diseases in the United States (US) and worldwide. It is also the third most common cause of death after heart diseases and cancer (4-7). Using anti-clot drugs such as recombinant tissue plasminogen activator (rtPA) in a short period is considered as the standard treatment of acute strokes. Two specific methods of thrombolytic therapies are employed by brain surgeons: intra-arterial thrombolysis and intravenous thrombolysis (8-14). Based on clinical guidelines, in the first 4.5 hours after the occurrence of the ischemic strokes, intravenous thrombolysis should be applied. However, the studies revealed that more than 50% of the patients do not receive an anti-clot in the defined time (15-18). Moreover, some studies suggested that application of intra-arterial thrombolysis should be replaced by intravenous thrombolysis (19-21). Revision of the literature revealed a conflict in the suggestions and the results of the studies. Due to the importance of employing thrombolytic therapy to treat ischemic strokes, it is important to reach a conclusive statement regarding the effectiveness and the results of each of these two types of thrombolysis to treat patients. Therefore, a review of the studies can be fruitful. Hence, the current study aimed at comparing the effectiveness and results of intravenous and intra-arterial thrombolysis methods. The current study was a systematic review based on PRISMA principles. Studies that investigated the clinical effectiveness of intravenous and intra-arterial injections of anti-clots such as rtPA using either trial design or cohort studies were included. Population of the studies included patients with acute strokes receiving anti-clot. The primary outcome was mortality rate. The secondary outcomes included national institutes of health stroke scale (NIHSS), neurological dementia, recanalization, intracranial hemorrhage, and the modified Rankin scale. Other outcomes were also taken into account. The studies investigating hemorrhagic strokes, case studies, retrospective studies, letters to the editors, and educational papers were excluded. In the first phase, the studies were extracted by searching keywords such as stroke, brain ischemia, ischemic stroke, streptokinase, urokinase, thrombolytic therapy, tissue plasminogen activator, intra-arterial, intravenous, and thrombolysis in Cochrane, PubMed, Google Scholar, Web of Science, and Embase databases. The selected time span was 1990 to 2017. To identify and cover more published articles, some journals with higher impact factors (IFs) were searched manually. The references of marked studies were also searched to avoid missing appropriate studies. All the included studies extracted based on the keywords were evaluated by two reviewers. The conflicts between the reviewers were settled by consulting with a third reviewer. STROBE and CONSORT checklists were employed for observatory studies and randomized clinical trial (RCT) papers, respectively. To extract data, first an extraction form was designed. This form included authors, publication year, study type, intervention and the number of participants in each group, the age of participants, NIHSS index score, the interval from the onset of symptoms to treatment, symptom improvement, neurological dementia, recanalization, intracranial hemorrhage, and mortality rate. To calculate mortality rate and symptom improvement, meta-analysis methods were used. If the heterogeneity rate between studies was less than 50%, fixed-effect model was employed; otherwise, the random effect was applied. CMA.2 (Comprehensive Meta-Analysis 2) software was used to conduct the meta-analysis. The results were reported in the form of forest plots. In the current study, P< 0.05 was taken as the level of significance. For uncertainty, sensitivity analysis was used for the results of meta-analysis. It was conducted by inserting upper/lower bound of confidence interval (CI) stated in the point estimates. Eight articles out of 1969 ones were included in the study (19-29). Figure 1 shows how the retrieved studies were screened. Four of the eight articles were included in the meta-analysis. The other four were not included due to not reporting proper numerical data. Six of the articles were experimental and two were prospective studies. All in all, 855 patients were analyzed. Generally, in both groups of intra-venous and intra-arterial thrombosis, no significant difference was observed regarding age and gender (P > 0.05). The mean age range of the patients was 60 - 66 and 58 - 68 years in the intra-arterial and intravenous groups, respectively. The NIHSS index score for both groups varied from 9 to 17. The mean onset time of the recovery symptoms was 3.75 and 3.05 hours in the intra-arterial and intravenous groups, respectively. The evaluation of the articles revealed that seven of them were biased in blinding. Moreover, in five of the included articles, the researchers knew which group was receiving intravenous or intra-arterial injection (this, admittedly, was inevitable due to the interventional nature of the investigated treatments). Only four of the articles had employed intent-to-treat analysis. Two of the studies had limitations regarding randomization. All in all, the quality of the evidence had low and moderate scores. Neurological dementia was reported in two of the included studies. In both of these studies, neurological dementia values were bigger in intra-arterial thrombolysis group than intravenous thrombolysis one. The mean of recanalization was 49% and 50.8 % in the intra-arterial and intravenous thrombolysis groups, which the difference was not statistically significant (P > 0.05). Intracranial hemorrhage was 11.33% and 9.52% in the intra-arterial and intravenous thrombolysis groups; the difference was not statistically significant (P > 0.05). The summary of the characteristics of included papers is presented in Table 1.
zAbbreviations: NIHSS, national institutes of health stroke scale; TIMI, thrombolysis in myocardial infarction; tPA, tissue plasminogen activator. aRankin score 0 to 2 at 90 days after stroke. bNIHSS Index ≥ 4 whithin 7 days. cFrom the onset of symptoms to treatment. The results showed that odds ratio (OR) was 3.28 (95% confidence interval (CI): 1.91 - 5.65; P < 0.001), which indicated that intra-arterial thrombolysis was more effective than intravenous thrombolysis in the symptom improvement (Figure 2). The heterogeneity results showed that the studies were homogenous (Q = 0.49, I2 = 0%, P = 0.921). Sensitivity analysis of the studies showed no significant difference in the symptoms improvement (Figure 3). The results showed that OR was 0.40 (95%CI: 0.17 - 0.92; P = 0.032), which indicated that intra-arterial thrombolysis was more effective in decreasing mortality rate than intravenous thrombolysis (Figure 4). The homogeneity results indicated that the studies were homogenous (Q = 1.01, I2 = 0%, P = 0.602). The sensitivity test showed no significant difference in mortality rate between the groups (Figure 5). The current study investigated the clinical effects of two anti-clot techniques such as rtPA to treat patients with acute strokes. In the current study, systematic review and meta-analysis were used to analyze the prospective clinical evidence. The current study showed that employment of intra-arterial method to inject anti-clot drugs into patients with acute stroke was superior to that of intravenous method. This was averred by investigating mortality rate and improvement in symptoms in such patients. Mortality rate of patients receiving anti-clot drug with intra-arterial method was lower than that of the ones with intravenous method. This superiority was also observed in exploring scale of improvement in symptoms in the patients. However, the number of neurological dementia events was higher in patients undergoing intra-arterial method than the intravenous method. The findings of the current study were not in line with those of the systematic review and meta-analysis conducted by Mullen et al. (30). In their study, the authors investigated six strategies and finally included 54 articles (contrary to the present study, Mulen et al. included all studies). The meta-analysis results initially showed a significant difference in symptom improvement and mortality rate in the six treatment strategies. However, this result was not constant after the sensitivity analysis test. The authors concluded that the observed changes were the result of different baseline states and personal characteristics of the patients rather than the treatments. One probable reason for this discrepancy between the findings of the current study and that of Mullen et al. can be the type of studies included. In their studies all types of articles (case studies, retrospectives, etc.) were included; while in the current study, only the RCT and prospective studies were included. In the systematic review and meta-analysis conducted by Wardlaw et al. the researchers investigated 2527 patients in 20 articles. The findings did not reveal any advantage of intravenous thrombolysis compared with intra-arterial thrombolysis (16). In the systematic review and meta-analysis conducted by Nam et al. four articles were included and 351 patients were analyzed. Two articles were included in the meta-analysis and the findings showed that intra-arterial thrombolysis was more effective in symptom recovery compared with intravenous thrombolysis. However, no significant difference was reported regarding mortality rate between the two groups (31). The studies included in the analysis phase showed differences regarding stroke severity, the type of employed interventions and the methodological quality. Furthermore, searching was just used in studies written either in English or Farsi. Although they were published in high IF journals of stroke, methodological quality of some of the studies were low, especially regarding blinding. This limitation can be due to the nature of the employed intervention, which cannot be easily blinded from clinicians. Improvement in symptom and mortality rate in intra-arterial thrombolysis group was significantly better that those of intravenous thrombolysis. In spite of the limitations in the selected articles, it can be concluded that if the patients with acute stroke are appropriately selected, intra-arterial thrombolysis can be more effective than intravenous thrombolysis. 1. Bernheisel CR, Schlaudecker JD, Leopold K. Subacute management of ischemic stroke. Am Fam Physician. 2011;84(12):1383-8. [PubMed: 22230273]. 2. Bill O, Zufferey P, Faouzi M, Michel P. Severe stroke: patient profile and predictors of favorable outcome. J Thromb Haemost. 2013;11(1):92-9. doi: 10.1111/jth.12066. [PubMed: 23140236]. 3. Silver B, Wulf Silver R. Stroke: subacute/inpatient management of acute ischemic stroke. FP Essent. 2014;420:23-7. [PubMed: 24818556]. 4. Mateen FJ, Buchan AM, Hill MD, Cases Investigators . Outcomes of thrombolysis for acute ischemic stroke in octogenarians versus nonagenarians. Stroke. 2010;41(8):1833-5. doi: 10.1161/STROKEAHA.110.586438. [PubMed: 20576948]. 5. Rodriguez-Yanez M, Alvarez-Sabin J, Davalos A, Diez-Tejedor E, Castillo J. [Thrombolytic therapy for acute ischemic stroke. Experience of SITS (Safe Implementation of Thrombolysis in Stroke) register]. Neurologia. 2009;24(5):288-91. [PubMed: 19642029]. 6. Ahmed N, Kellert L, Lees KR, Mikulik R, Tatlisumak T, Toni D, et al. Results of intravenous thrombolysis within 4.5 to 6 hours and updated results within 3 to 4.5 hours of onset of acute ischemic stroke recorded in the Safe Implementation of Treatment in Stroke International Stroke Thrombolysis Register (SITS-ISTR): an observational study. JAMA Neurol. 2013;70(7):837-44. doi: 10.1001/jamaneurol.2013.406. [PubMed: 23689267]. 7. Akins PT, Delemos C, Wentworth D, Byer J, Schorer SJ, Atkinson RP. Can emergency department physicians safely and effectively initiate thrombolysis for acute ischemic stroke? Neurology. 2000;55(12):1801-5. [PubMed: 11134376]. 8. Higashida T. Thrombolysis in acute ischemic stroke. Intra-arterial and intra-venous. Interv Neuroradiol. 2003;9(Suppl 2):39-40. doi: 10.1177/15910199030090S204. [PubMed: 20591279]. 9. Huded V, Dhomne S, Shrivastava M, Saraf R, Limaye U. Intra-arterial thrombolysis in acute ischemic stroke: a single center experience. Neurol India. 2009;57(6):764-7. doi: 10.4103/0028-3886.59473. [PubMed: 20139506]. 10. Jovin T, Gebel JM, Wechsler LR. Intra-arterial thrombolysis for acute ischemic stroke. J Stroke Cerebrovasc Dis. 2002;11(3-4):148-61. doi: 10.1053/jscd.2002.129962. [PubMed: 17903871]. 11. Kan PT, Orion D, Yashar P, Levy EI. Intra-arterial thrombolysis and thrombectomy for acute ischemic stroke: technique and results. J Neurosurg Sci. 2011;55(2):151-60. [PubMed: 21623327]. 12. Hacke W, Kaste M, Bluhmki E, Brozman M, Davalos A, Guidetti D, et al. Thrombolysis with alteplase 3 to 4.5 hours after acute ischemic stroke. N Engl J Med. 2008;359(13):1317-29. doi: 10.1056/NEJMoa0804656. [PubMed: 18815396]. 13. Harsany M, Tsivgoulis G, Alexandrov AV. Intravenous thrombolysis in acute ischemic stroke: standard and potential future applications. Expert Rev Neurother. 2014;14(8):879-92. doi: 10.1586/14737175.2014.934676. [PubMed: 24984941]. 14. Hassan AE, Chaudhry SA, Jani V, Grigoryan M, Khan AA, Adil MM, et al. Is there a decreased risk of intracerebral hemorrhage and mortality in obese patients treated with intravenous thrombolysis in acute ischemic stroke? J Stroke Cerebrovasc Dis. 2013;22(4):545-9. doi: 10.1016/j.jstrokecerebrovasdis.2013.01.022. [PubMed: 23453555]. 15. Del Zoppo GJ, Saver JL, Jauch EC, Adams HJ, American Heart Association Stroke C. Expansion of the time window for treatment of acute ischemic stroke with intravenous tissue plasminogen activator: a science advisory from the American Heart Association/American Stroke Association. Stroke. 2009;40(8):2945-8. doi: 10.1161/STROKEAHA.109.192535. [PubMed: 19478221]. 16. Wardlaw JM, Koumellis P, Liu M. Thrombolysis (different doses, routes of administration and agents) for acute ischaemic stroke. Cochrane Database Syst Rev. 2013;(5). CD000514. doi: 10.1002/14651858.CD000514.pub3. [PubMed: 23728633]. 17. Wardlaw JM, Lindley RI, Lewis S. Thrombolysis for acute ischemic stroke: still a treatment for the few by the few. West J Med. 2002;176(3):198-9. [PubMed: 12016247]. 18. Wardlaw JM, Sandercock PA, Warlow CP, Lindley RI. Trials of thrombolysis in acute ischemic stroke: does the choice of primary outcome measure really matter? Stroke. 2000;31(5):1133-5. [PubMed: 10797177]. 19. Furlan A, Higashida R, Wechsler L, Gent M, Rowley H, Kase C, et al. Intra-arterial prourokinase for acute ischemic stroke. The PROACT II study: a randomized controlled trial. Prolyse in Acute Cerebral Thromboembolism. JAMA. 1999;282(21):2003-11. [PubMed: 10591382]. 20. Furlan AJ. Thrombolysis for acute ischemic stroke: update on the beginning of a revolution. Cleve Clin J Med. 1998;65(4):185-90. [PubMed: 9597783]. 21. Smith WS, Sung G, Saver J, Budzik R, Duckwiler G, Liebeskind DS, et al. Mechanical thrombectomy for acute ischemic stroke: final results of the Multi MERCI trial. Stroke. 2008;39(4):1205-12. doi: 10.1161/STROKEAHA.107.497115. [PubMed: 18309168]. 22. Khan K, Kunz R, Kleijnen J, Antes G. Systematic reviews to support evidence-based medicine. Crc Press; 2011. 23. Sen S, Huang DY, Akhavan O, Wilson S, Verro P, Solander S. IV vs. IA TPA in acute ischemic stroke with CT angiographic evidence of major vessel occlusion: a feasibility study. Neurocrit Care. 2009;11(1):76-81. doi: 10.1007/s12028-009-9204-1. [PubMed: 19277904]. 24. Ciccone A, Valvassori L, Ponzio M, Ballabio E, Gasparotti R, Sessa M, et al. Intra-arterial or intravenous thrombolysis for acute ischemic stroke? The SYNTHESIS pilot trial. J Neurointerv Surg. 2010;2(1):74-9. doi: 10.1136/jnis.2009.001388. [PubMed: 21990564]. 25. Ciccone A, Valvassori L, Synthesis Expansion Investigators . Endovascular treatment for acute ischemic stroke. N Engl J Med. 2013;368(25):2433-4. [PubMed: 23802240]. 26. Zhang B, Sun X, Li M, Wang F, Xu D, Duan H, et al. Intra-arterial vs intra-venous. Thrombolysis for anterior cerebral occlusion. Can J Neurol Sci. 2010;37(2):240-4. [PubMed: 20437936]. 27. Mattle HP, Arnold M, Georgiadis D, Baumann C, Nedeltchev K, Benninger D, et al. Comparison of intraarterial and intravenous thrombolysis for ischemic stroke with hyperdense middle cerebral artery sign. Stroke. 2008;39(2):379-83. doi: 10.1161/STROKEAHA.107.492348. [PubMed: 18096842]. 28. Ducrocq X, Bracard S, Taillandier L, Anxionnat R, Lacour JC, Guillemin F, et al. Comparison of intravenous and intra-arterial urokinase thrombolysis for acute ischaemic stroke. J Neuroradiol. 2005;32(1):26-32. [PubMed: 15798610]. 29. Lewandowski CA, Frankel M, Tomsick TA, Broderick J, Frey J, Clark W, et al. Combined intravenous and intra-arterial r-TPA versus intra-arterial therapy of acute ischemic stroke: Emergency Management of Stroke (EMS) Bridging Trial. Stroke. 1999;30(12):2598-605. [PubMed: 10582984]. 30. Mullen MT, Pisapia JM, Tilwa S, Messe SR, Stein SC. Systematic review of outcome after ischemic stroke due to anterior circulation occlusion treated with intravenous, intra-arterial, or combined intravenous+intra-arterial thrombolysis. Stroke. 2012;43(9):2350-5. doi: 10.1161/STROKEAHA.111.639211. [PubMed: 22811451]. 31. Nam J, Jing H, O'Reilly D. Intra-arterial thrombolysis vs. standard treatment or intravenous thrombolysis in adults with acute ischemic stroke: a systematic review and meta-analysis. Int J Stroke. 2015;10(1):13-22. doi: 10.1111/j.1747-4949.2012.00914.x. [PubMed: 23294872].